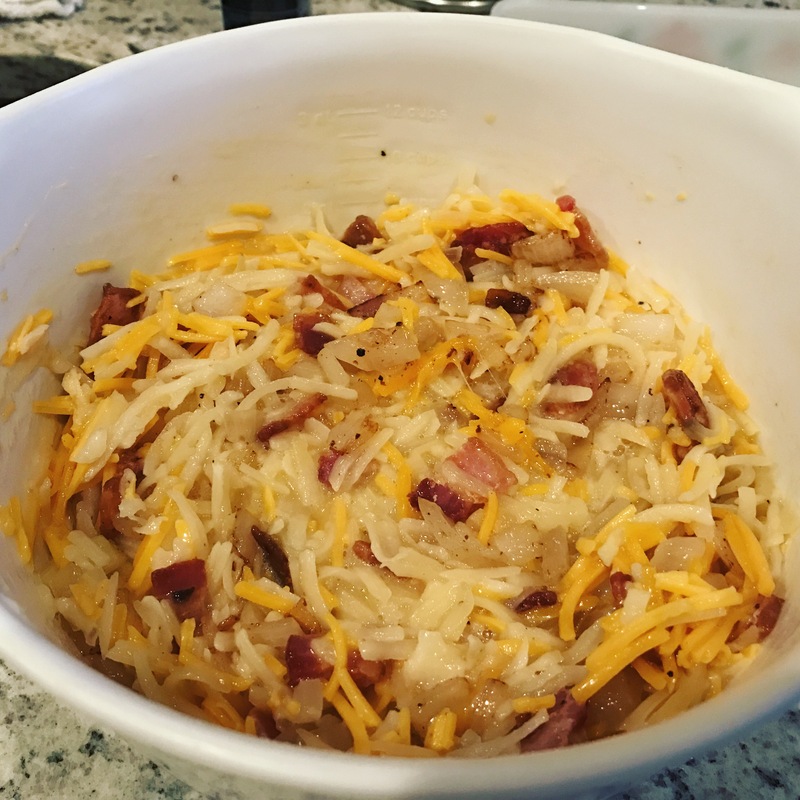 This recipe is a fun way to mix it up for breakfast. It is also an amazing way to serve breakfast to a crowd. It can actually be made the night before and refrigerated. I did this for the holidays to save some time and mess on Christmas Day. This recipe will easily serve 8 people as prepared. I would recommend dividing it in half and baking half in an 8 inch square pan. I like to take the other half and freeze it in a disposable foil dish. Then you have breakfast ready to go in the freezer next time you have guests visiting or just can’t bear to make a mess of your kitchen. As far as brunch wines go… you probably already know what I am going to suggest. Sparkling wine, duh. If your fridge doesn’t have at least two different sparkling wines in it at all times, you are living your life wrong. If you really like the people you’re serving brunch to… then pour some Mumm or Chandon. If the people you’re serving brunch to drink a lot… pour Friexenet or Jaume Serra and make mimosas. This spring I will be serving one thing and one thing only, grapefruit mimosas. My second favorite mimosa mixer is cider. I love the unfiltered cider from Trader Joe’s but any hard cider added to your mimosa will really kickstart your weekend. Add in a quick pour of Laird’s Applejack and get ready to ruin your Saturday. 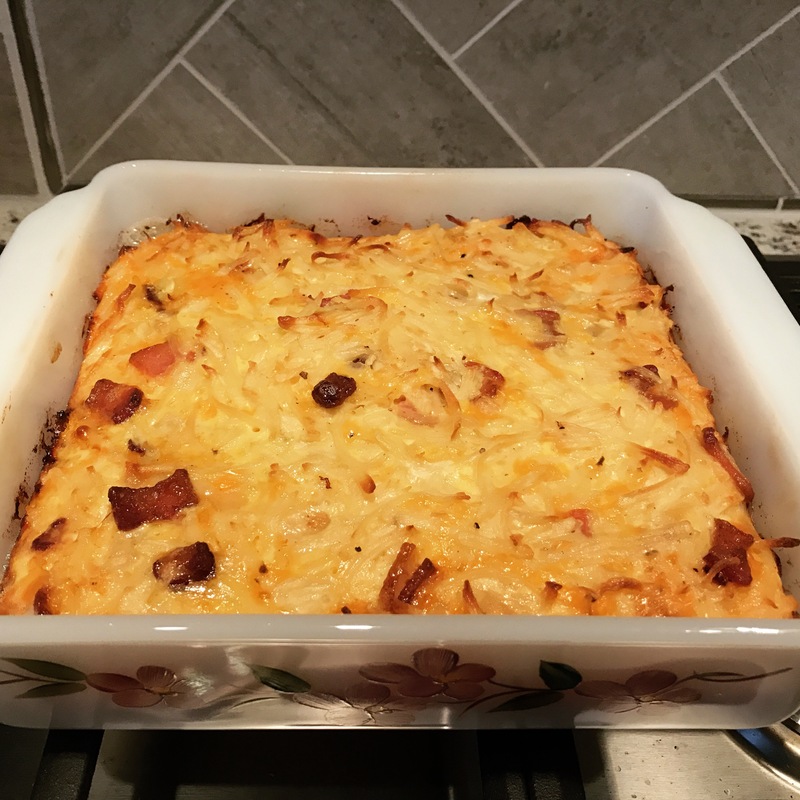 This brunch casserole plus Apple Cider Mimosas are basically the perfect meal for a group on vacation, skiing, beaching, or if you are just going to any of the fabulous parades and festivals in the KC area. Preheat oven to 350 degrees. Lightly grease a 13×9 inch baking pan. Plae the bacon on a foil lined baking sheet and cook for about 20 minutes, until it is crispy. Crumble the cooked bacon. 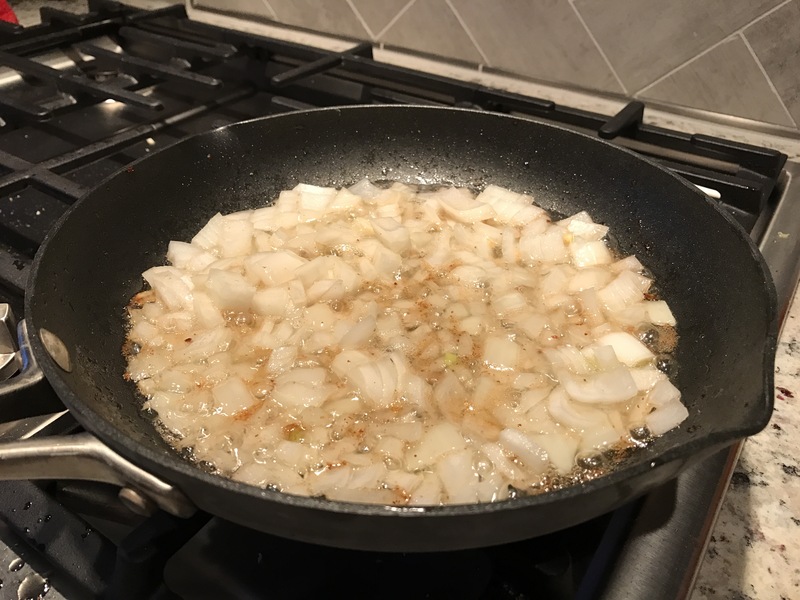 In a large skillet, heat the bacon grease (or olive oil or butter). Saute the onion and bell pepper for about 7 minutes until it is soft. Add in the garlic, sun dried tomatoes, 1 tsp salt and cook for 2 more minutes. In a metal bowl, beat the eggs and whisk in the milk and black pepper. Stir in 2/3 of the cheese, the potatoes, the bacon, and the cooked onion mixture. Pour this into the prepared baking dish. Sprinkle with the remaining cheese. Bake for 40 minutes or until the edges are firm. If everything is cold in the fridge, just pour all ingredients into a champagne flute and serve. If not cold, shake up the applejack and the cider in a cocktail shaker and pour into a champagne flute, finish with sparkling wine. You can also serve the applejack and cider over ice and fill the glass to the top with sparkling wine. These are Bubbly Kitchen original recipes. The day I watched Glenn Roberts of Anson Mills processing farro on A Chef’s Life, I became obsessed with locally sourced and heirloom grains. The only heirloom farro grown in America comes from Anson Mills. You can find farro at your local grocery store or Trader Joes, but if you want to explore heirloom grains, place an order from Anson Mills. Try some new things! Cornmeal, grits, flour, Carolina gold rice, red peas… you just cannot go wrong. They also have a number of recipes and tips on their website for cooking with these products. Read through these recipes before you start experimenting. The products from Anson Mills are not your typical grocery store grains/rice. These are the real deal. These are the grains people were eating 200 years ago. So they may take a little longer to cook, they may require overnight soaking. But it is worth every bit of effort. These are freshly stone ground grains so they must also be stored in the freezer as well. It is incredibly sad how far the quality of our flours, grains, rice has fallen in the US for the sake of profits and efficiency. The only way to fix it is to support the pioneers like Glenn Roberts, who has basically brought back once lost heirloom varieties of grits, rice, and farro, just to name a few. The farro here takes the place of pasta which makes this dish much healthier, in my opinion. One serving of farro has upwards of 7 grams of protein and 7 grams of fiber. Not to mention it contains a number of other vitamins – thiamine, iron, niacin, zinc. It is also 100% whole grain (if you believe in the whole grain voodoo). Farro is much more complex than your traditional white pastas, it does have carbs but they burn slower. This meal will stick with you and keeps extremely well in the fridge or freezer for future lunches. When prepping lunches, I put this in containers with lima beans or green beans. 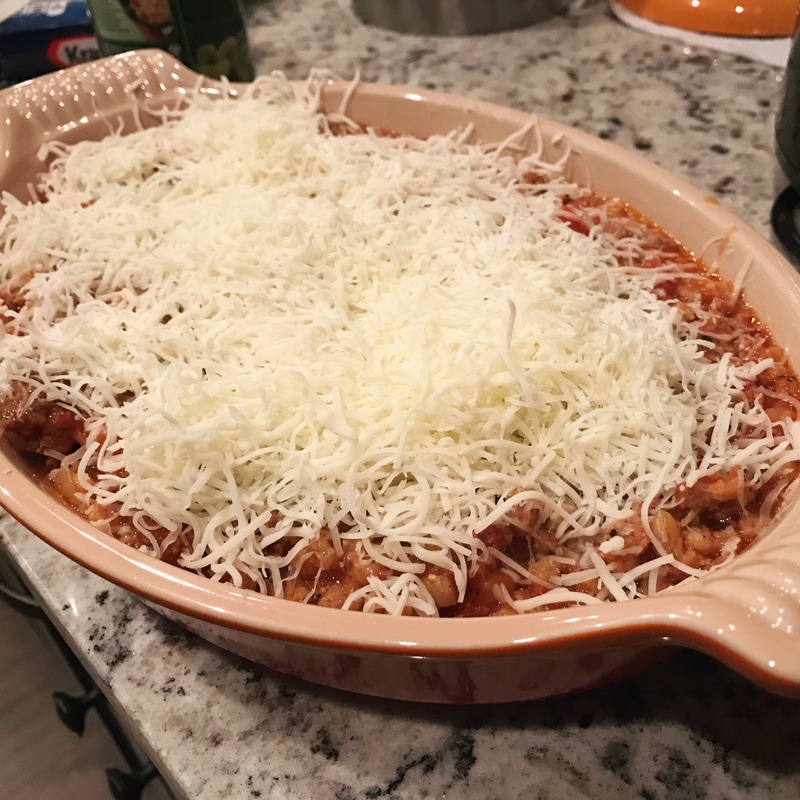 This recipe actually makes a lot and I froze an entire 28 oz container with cheese sprinkled on top, ready to go for a last minute meal. The other day I woke up to the best news ever, my husband got a snow day! Which means he would actually be off work during my day off during the week! While we were lazing around on the couch after having breakfast, he asked me, “well what did you have planned for today?” And I told him… “You’re looking at it…” My plans were to make this cinnamon bread and photograph it for the blog and to make Thomas Keller’s Roast Chicken with Root Vegetables for dinner. My current daily aspiration is to aggressively cook from Ad Hoc at Home . 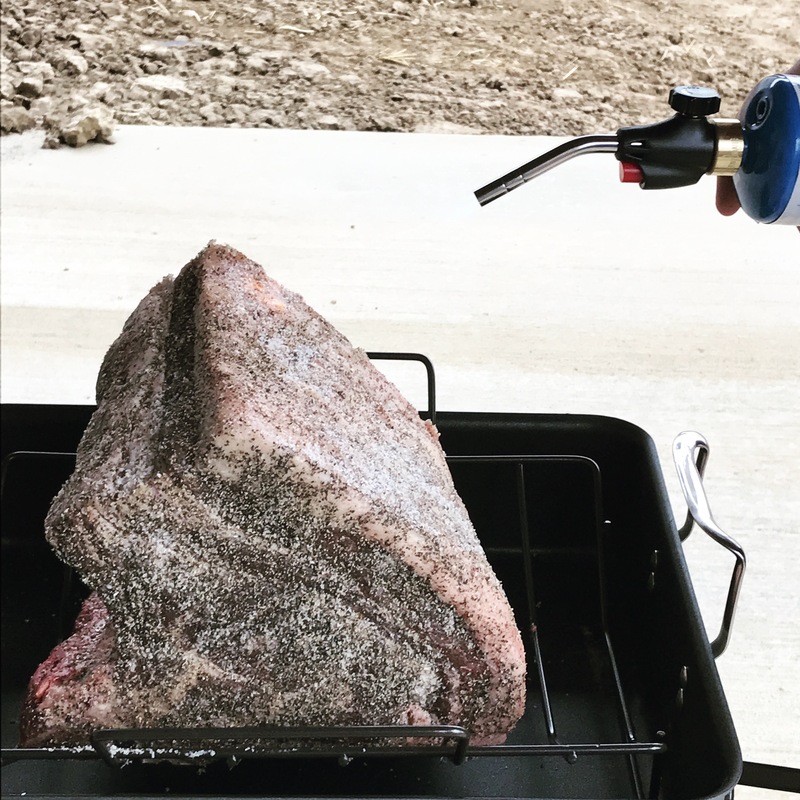 You can look forward to Blowtorch Prime Rib and Buttermilk biscuits, coming soon to the blog! We are in the beginning stages of planning our next Napa trip and Thomas Keller’s restaurant, ad hoc, will not be skipped. I could not think of a better way to get back into blogging and start the new year than with these amazing pepperoni rolls. These fabulous rolls are apparently the official food of West Virginia. They were first served at a bakery in 1927 as a lunch option for coal miners. The first time I ate these rolls was on the beach in Wilmington at my bff’s bachelorette party. Her mom is an expert pepperoni roll maker from WV. I was instantly addicted. They really are the perfect on the go food. So this story should kind of explain my absence from blogging… We took a lot of trips this year. WV, Mexico, Austin, Houston, Wilmington, Durham. We also built a house and made a human who will arrive sometime in March. Excuses, excuses. But I have a number of amazing new cookbooks that I am beyond excited to dive into and share on the blog. Now that we are moved into our new home with our incredible kitchen I’ve made a long to-do list from Vivian Howard’s new book, the Poole’s diner cookbook, Dorie’s Cookies, ad hoc at home, just to name a few. There are some arguments about what makes the best pepperoni roll. Most west Virginians seem to prefer the chopped up stick pepperoni. 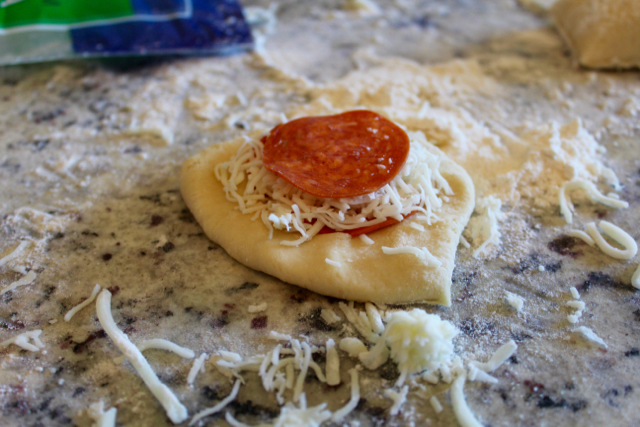 But I kind of like layering the sliced pepperoni with shredded mozzarella cheese, as in the recipe below. You can obviously use whatever pepperoni and cheese you have on hand. Some people believe these should be made with Colby jack, and I’m sure you could substitute this or cheddar or whatever cheese you have in your fridge. There are also some recipes out there that use cubes cut from blocks of cheese. 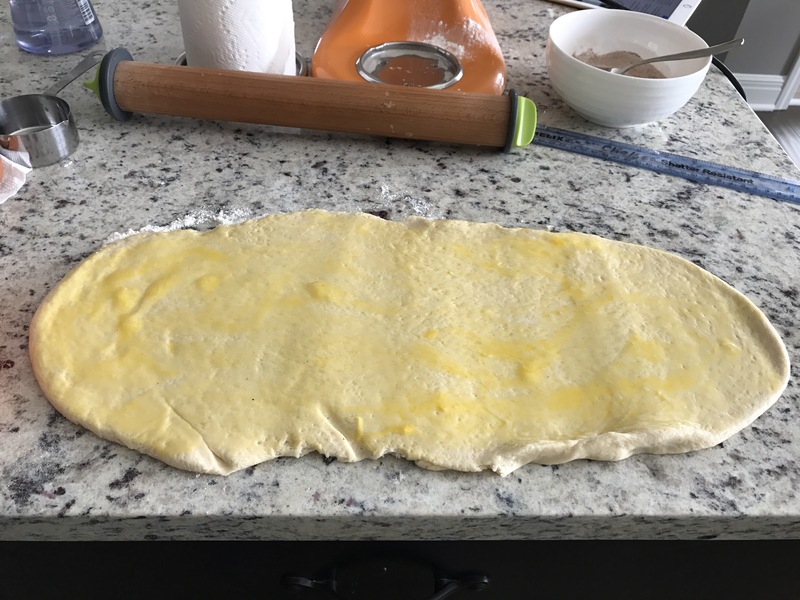 So, make this basic roll dough and stuff whatever delicious meats and cheeses you have in your fridge inside, and I think it will probably be good. Not to mention, you can throw them in a big ziplock and take them to the beach, the park, skiing, wine tasting, tailgating, float tripping. The possibilities are endless! I have tried some Italian bread recipes for these rolls and I just really prefer my basic soft dinner roll. This roll recipe is simple and nearly fool proof. Unless it’s Christmas, you’re hosting 14 people, and you forget to put the salt in your bread dough. Everyone still seemed to like the dinner rolls but for me they were a mega failure. 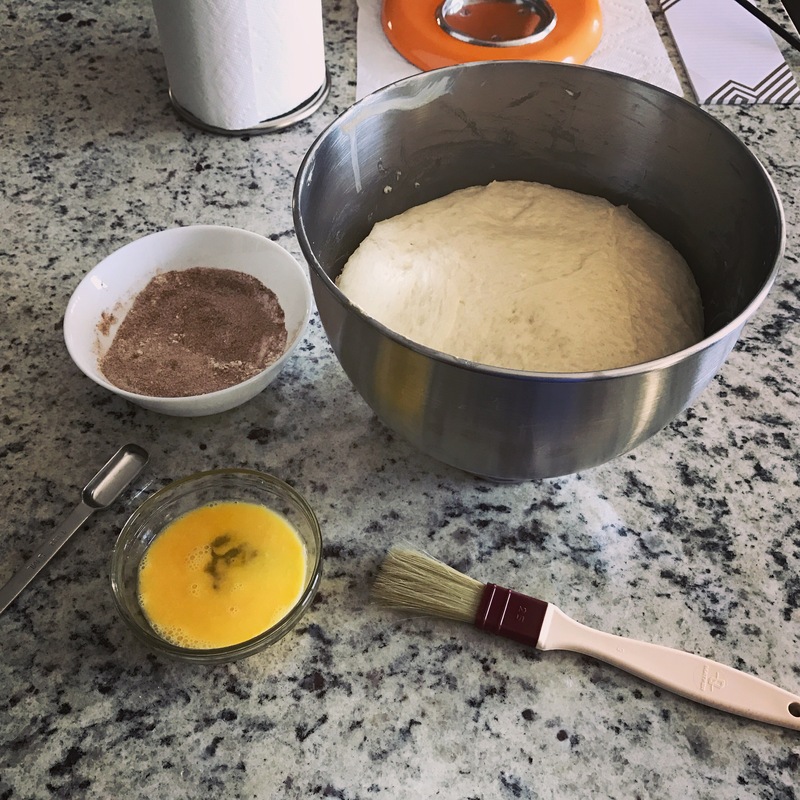 You can use your stand mixer to knead the dough and save yourself frustration/time/mess. The dough will seem really sticky when you set it aside to rise, don’t worry. 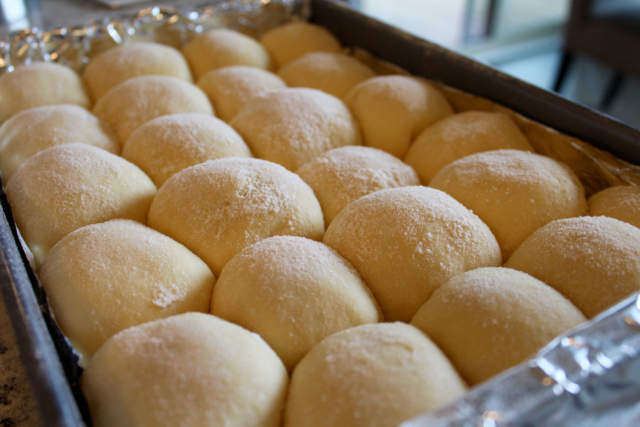 Do use plenty of flour when you go to form your rolls. This recipe should make 24 pepperoni rolls. So just divide your dough into 4 pieces, divide those in half, and divide the 8 pieces you have now into thirds. This video will give you some idea of how to form your rolls. I admit that this batch during the video really had a bit too much flour. 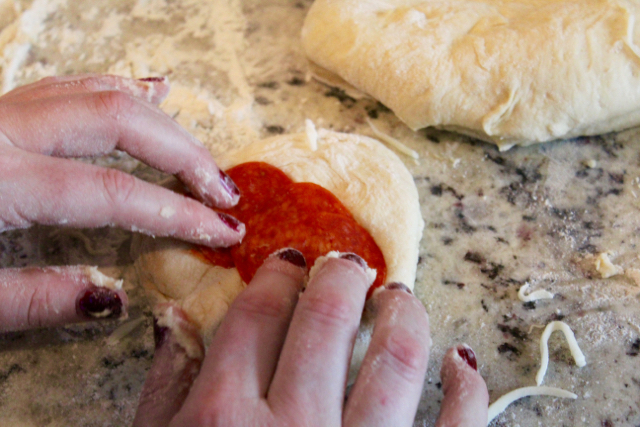 The dough should really be stickier and you will be patting it out more than rolling it in your hands. As far as wine pairings go, there are a number of options here. If you are eating these in the winter or at a football tailgate, serve them with sangiovese or pinot noir. But if you are eating these on the beach or during a day out on a boat… three words: Rosé all day. You really cannot go wrong with most rosé wines if you spend about $12. Justin makes a fabulous blush wine for about $20 if you want to spend a little more. You can also impress your wine loving friends and go for a côtes du rhône rosé such as E. Guigal. I would hazard to say that any rosé sparkling wine will pair excellently with these pepperoni rolls on a hot day. In a small saucepan, over medium heat, bring milk to a simmer. Remove from heat and mix in the butter salt, and sugar. 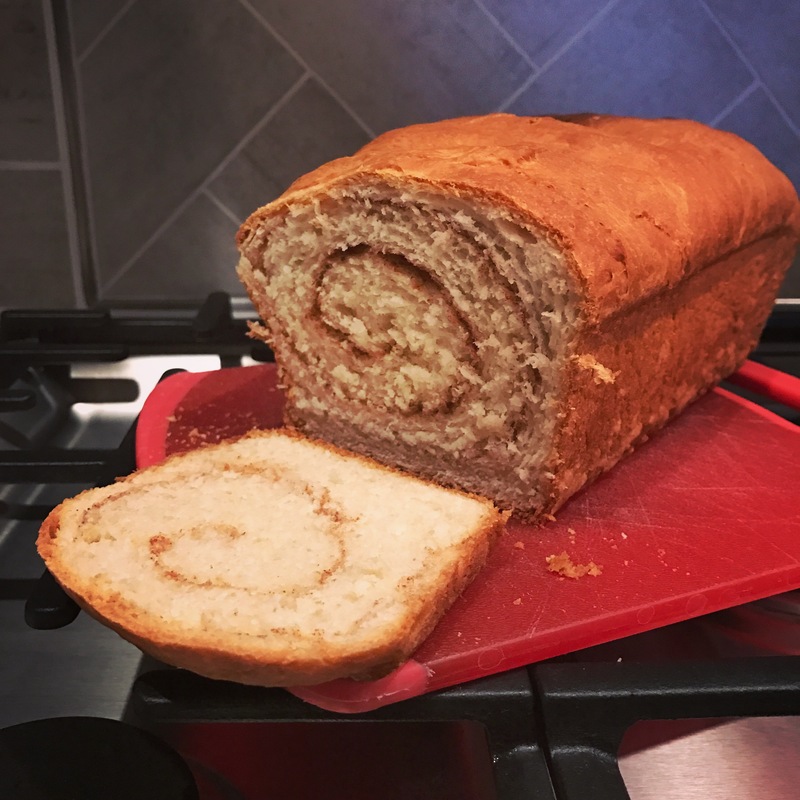 Allow this to cool for 10 min while you measure the rest of your ingredients. Dissolve the yeast in 1/2 cup warm water, making sure it foams up. Fit your stand mixer with a dough hook and pour the milk/butter/sugar/salt into the bowl of the mixer. Pour in the 3 eggs, yeast dissolved in water, and about half the flour. Beat on low speed until this is all incorporated. Add in the rest of the flour, 1/2 cup at a time, until the dough starts to pull away from the sides of bowl. Knead with the dough hook, on low to medium speed, for 5 minutes. Oil a large bowl with olive oil and dump the dough from the mixer into this, turning to coat the dough. Lightly cover with a towel or Saran Wrap. Allow the dough to sit in a warm place for at least 90 minutes, or until it doubles in size. Line a 9 x 13 inch metal pan with parchment (or foil/release paper) or butter/flour the pan. On a well floured surface, dump the dough out of the bowl. 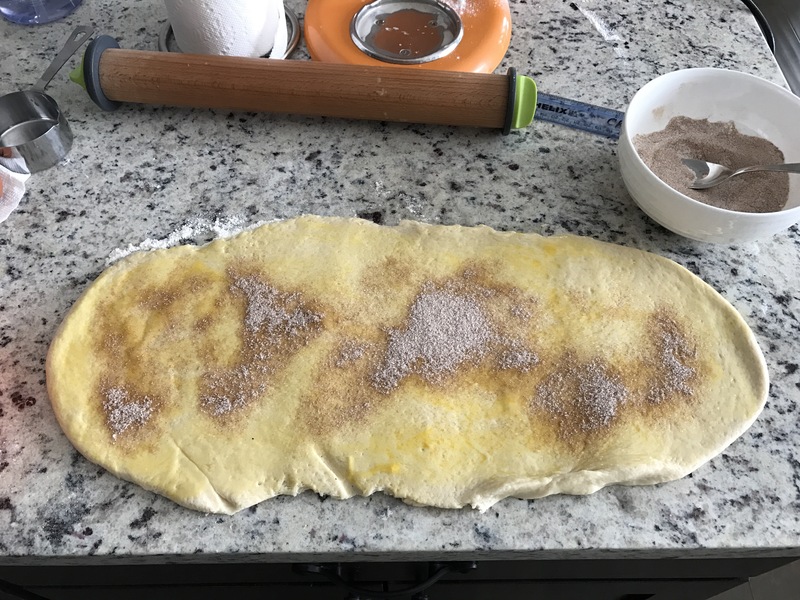 Divide the dough into fourths. Divide these pieces in half. Divide each of these pieces into three. You should get 24 pepperoni rolls. 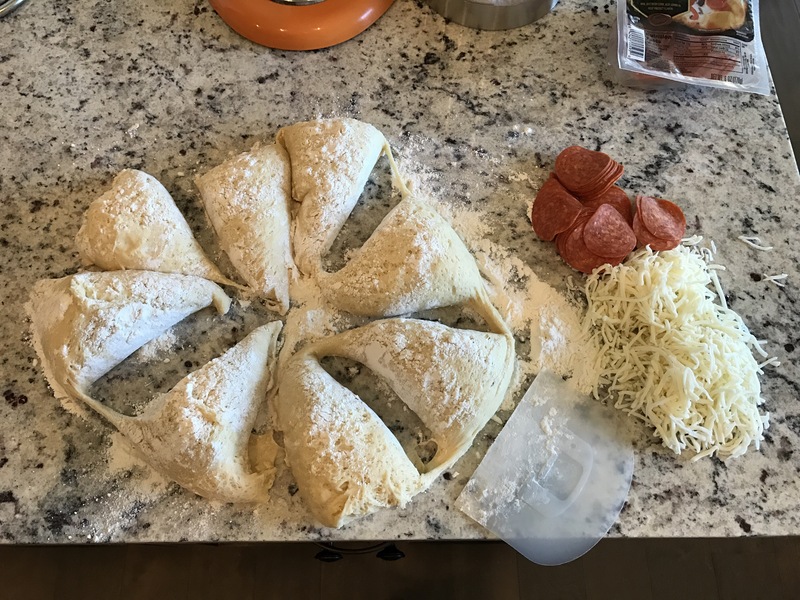 Flatten each piece of dough with your hands and press 4-5 pepperoni slices and pinch of mozzarella cheese into the dough. (I try to jam in as much pepperonis and cheese as I can.) See the above picture for reference. 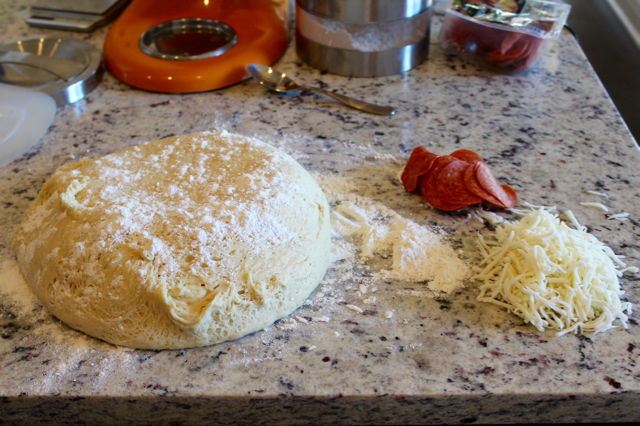 Pull the bottom dough around the pepperonis and cheese, pinching together. Flip it over and mold into a ball as best you can. Place into the pan with the pinched side down. Allow the rolls to rise for 30-40 minutes until they are poofed up. 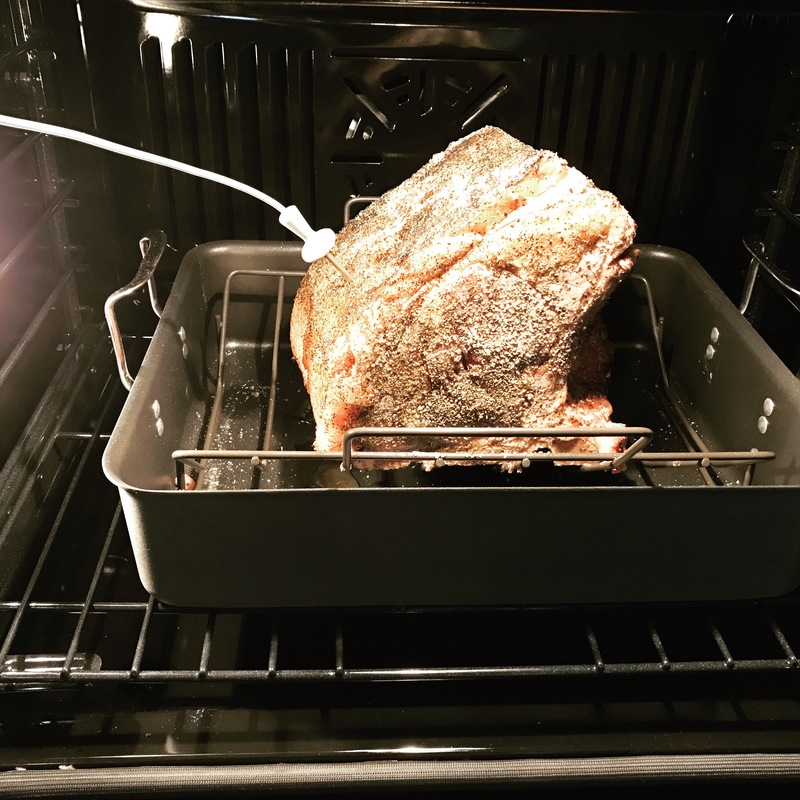 Preheat oven to 350 degrees and adjust a rack so it is in the center of the oven. Sprinkle with shredded parmesan and Italian seasoning if you desire. Bake for 20 minutes, rotating halfway through, until they are golden brown.